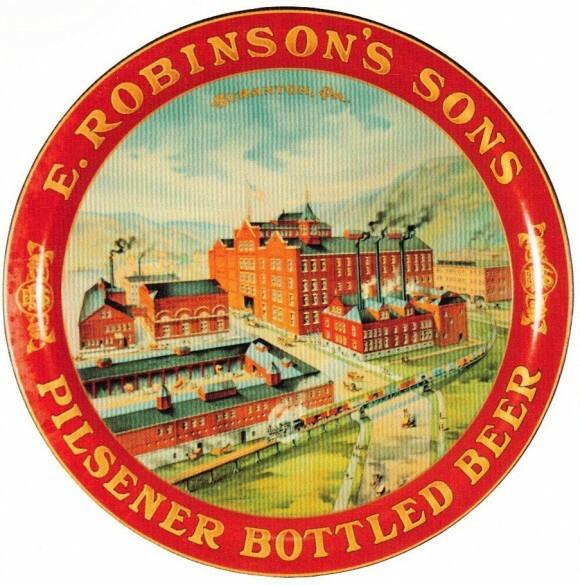 Serving Tray for Pilsener Bottled Beer from E. Robinson’s Sons showing in the background the Brewery where the beer is made. This is a great factory tray that shows lots of activity, architectural detail, and scenery. This tray was produced as both a dish style and an inverted pie style (shown). The inverted pie is rarer and more valuable. These trays are pre-prohibition 12″ round produced by Hausermann Litho of Chicago. If you have an E. Robinson’s Sons tray please contact us for an offer or appraisal.